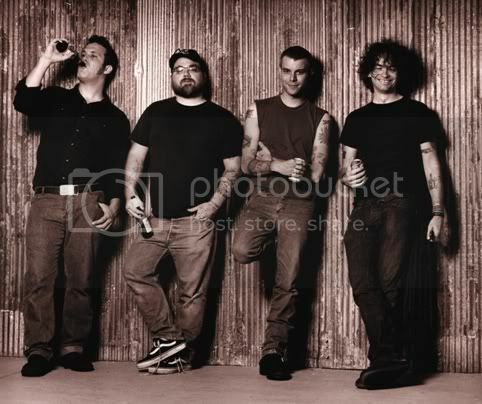 WHEELS ARE WORN, HEARTS OF GOLD: The Nation's Hardest Touring Indie Rock Band, Memphis' Lucero have earned a solid reputation for putting on great live shows everywhere they go. The band's DIY approach to their Alt-Country music and touring over five albums has earned them considerable credibility with a large, fiercely devoted following, and earned them admiration from many bands. The band will look to extend their fanbase this month by kicking off a Spring tour stretching over the next 60 days of the calendar. Lucero arrives in Boston on Thursday night (4/16), playing with Titus Andronicus at the Paradise. A NEW ALBUM IN '09 - All this touring is definitely leading up to something... This fall, Lucero releases their sixth album (their first on the Universal label) - a collection that is being described as "a true Memphis-inspired record, with local luminaries adding horns to over half the tracks." We can't wait! I'll be there. If all goes as planned, I'll get there early and set up camp on the left side of the stage (by the stage entrance). I've had some good luck getting a good spot there in the past. Stop by, if you see me (dark hair, mustache, glasses). If you haven't seen it, check out the video for Dreaming In America a film about Lucero. Great show! I actually brought my camera to this and was right up front, so I may have some pix to share later. They do get compared to The Replacements, but Uncle Tupelo is a lot closer (for me), and I'm a huge Uncle Tupelo fan. BTW, if you're interested in seeing the more popular half of Uncle Tupelo, tix for Wilco in Lowell on July 11 go on sale Sat. I'm more of a Son Volt fan myself, but I may try to check it out myself. The band Titus Andronicus opened with noisy indie rock. They were loud, fast and entertaining. I posted some photos from the Paradise show online. It was a great show. I'd see them again.